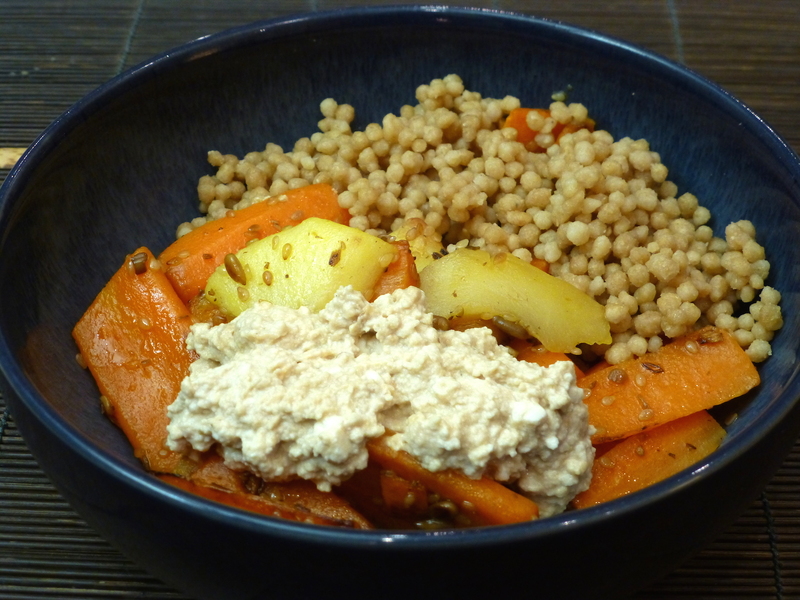 Stir-fried carrots with tofu-hummus and maftoul • Quick & Tasty - Get Cooking! Carrots are great when stir fried with some seeds and spices. I cook them in the microwave for a short time so the frying is quicker, and I add apples as a sweetener. The tofu-hummus is very similar to the Japanese shiraae, and very easy and quick to make. This goes really well with maftoul (giant couscous). Put the maftoul in a microwave pot with 1.5 cups of water and a teaspoon soy sauce and cook for 4 minutes at full power (900W). Peel the apple and slice quite thinly. Wash and dice the carrots. Cook them in the microwave, about 5 minutes on full power (900W). When the carrots are done, stir the maftoul, then cook it for 4 more minutes on full power (900W). Meanwhile, heat the olive oil and fry the ginger, spices and seeds for a few minutes on medium heat. Add the carrots and stir-fry on high heat for a few minutes. Add the apple slices and stir-fry on high heat for a few minutes. Put the tofu pieces in a bowl with the tahini, miso and sugar and scramble with a fork or chops sticks until the mixture is smooth but still a little chunky.